Check out the article below from Lee Breslouer with Thrillist about Osaka’s delicious and unique Osaka Burger! Then be sure to stop on in to try one yourself! Osaka Restaurant – a new way to Japanese! Combining pancakes and burgers is not a thing, despite IHOP getting super into burgers lately. But at Osaka’s, a new Japanese restaurant in Boulder, Colorado, owner Koji Tamura bravely combined the two foods for a unique take on the all-American burger. He took the Japanese food okonomiyaki — a savory pancake usually made from cabbage, but sometimes kale — and transformed them into burger buns. Then he filled it with everything from chicken to pork, beef, and veggies. 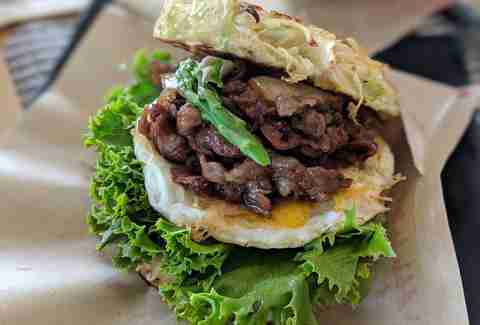 He’s serving what he says is the first okonomiyaki-style burger in America, and it’s damn good. 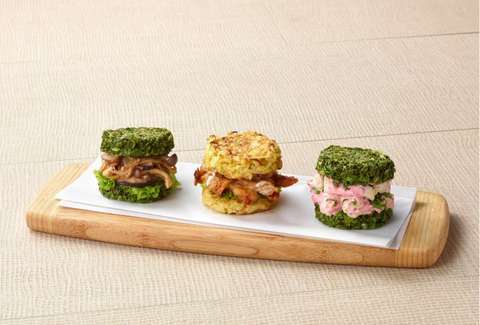 Is America ready for the kale okonomiyaki burger? Let’s hope so. It all started when Osaka, Japan-born Koji Tamura went to college in Los Angeles in the ‘70s. His classmates asked Tamura to prepare them some Japanese cuisine — wait, you can just ask your friends to make you dinner?! — and he made okonomiyaki. It’s not a fast-casual spot. Osaka’s looks like a modern Japanese eatery — plenty of wood and beautiful lighting, with much of the decor selected by his wife. Two of Osaka’s chefs came with him from an earlier iteration of the restaurant in Kobe, Japan. They serve a full menu of Japanese comfort food and his favorite dish from Osaka, except for with an American twist. Then he turned okonomiyaki into a burger. But lest you think this is another flash-in-the-pan like that ramen burger craze of 2013, this is has the potential for a longer life. See, no one eats ramen scrunched up into bun-form. But when Osaka’s turned cabbage-filled okonomiyaki into a burger bun, it wasn’t too much of a change — it’s just two bun-sized pancakes with a little hinge on the back. And because they’re based in super health-conscious Boulder (and because people are generally interested in living longer! 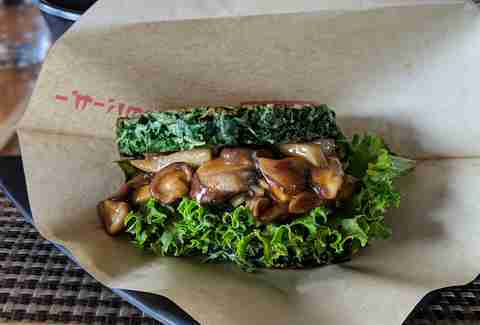 ), they developed a kale burger as well. Both the kale and the cabbage burgers can be filled with anything from sukiyaki beef to sliced pork and noodles with garlic sauce to shredded chicken, a fried egg, and a shiso leaf with a plum mayo sauce. I sat down and tried a pair. And I was converted. skeptical, as I was worried the kale would be bitter and the mushrooms would be earthy, and I’d have to politely excuse myself from the table to deposit my napkin in a trash can. Thankfully, the burger was delicious and satisfying. It doesn’t taste overly kale-y. “Once you cook the kale, it sweetens and kind of caramelizes,” Charlie Curtis, Osaka’s GM told me. I thought it’d be kale overload, but it was just the essence of kale and a ton of mushrooms with a decadent butter ponzu sauce I want to bottle and put on everything. The kale bun didn’t fall apart either — it stayed together like everyone’s parents were supposed to. My favorite types of foods are ones that feel familiar and unique all at the same time — there’s a reason the ramen burger captured America’s attention for a hot minute — and these Osaka Burgers fit right into that wheelhouse. America has already embraced Japan’s sushi and ramen, so why can’t it warm up to this play on okonomiyaki? While this is only the first restaurant, Tamura has big plans for more Osaka’s locations. And who knows, maybe IHOB — sorry, IHOP — will one day serve a kale okonomiyaki-style burger too. IHOO has a nice ring to it.